©2004-18 paulf. All rights reserved. 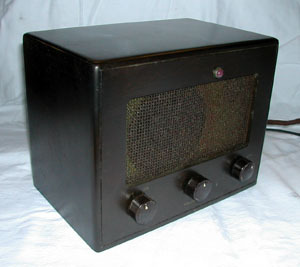 The 300 series was made from 1936 until 1954. The basic design is found in models numbered from 250 to 466. During its lifetime, over 25 million sets were produced. 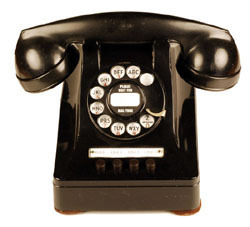 The 300 series was Western's first desk set family that included the ringer, coil and capacitor in the base, forming a complete phone in one package. Previous models required an external subscriber set (subset), which contained these components. 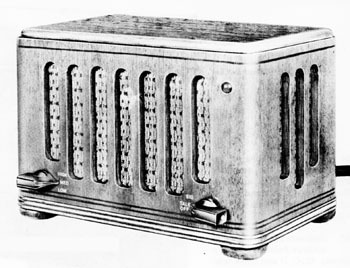 Base housings were made of metal from 1936-46. 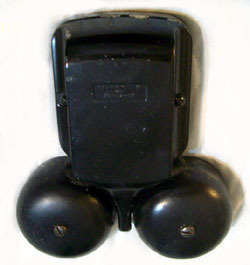 Thermoplastic housings were made from 1941-1954. The Family's life was extended into the 1960s as parts were refurbed in to the "modern" looking 5300s, which looked somewhat like the 500-series (announced in 1949). This page is intended to be a quick summary of the models produced and major functions. Western catalogs and technical documentation only show the models that were in production or service at the publication date. To understand the full scope of models produced we must compile data from many years of documents. Each phone has a 3-digit model number beginning with 2, 3 or 4. These are usually, but not always marked in ink on the bottom of the phone. If a model number is not found, look for a mounting code. Model numbers have suffix letters that define variations, such as manual/dial or number of mounting cord conductors. Some are defined below, but for details check the Bell System technical documentation (e.g. catalogs and BSPs - Bell System Practices). Mounting codes are assigned for combinations of mechanical and electrical features unique to each model. They are typically located near the rear cord hole, on the outside stamped into the metal on early sets and inside in red ink on later sets and thermoplastic sets. You can usually see the mounting code even if inside, by looking around the line cord or in the recess for the rear bottom plate screw. outside of an early die cast zinc base and inside a later Tenite plastic base. If you're identifying a phone, you still need to check the internal components as many phones were refurbed and had internal components changed or removed. If done in a Bell System refurb facility, the code on the bottom was usually repainted or remarked. Many independent shops or field mods were not remarked with the accurate model number. NOTE: You can "search" for mounting codes or model numbers on this page by adding # and the code to the page URL. know the model number and want to find the mounting code. For color information, see: Phones in color! For a chart showing component evolution on early 302 sets, see this chart prepared by Hal Belden. Most info in the chart below is from manufacturer catalogs and ads plus discussions on the ATCA and TCI listservs. No claim is made regarding accuracy or completeness. If you're enjoying looking at this level of detail and haven't joined one of the phone clubs yet, see the links page. This page is a work in progress. Please send comments, additions and corrections. AA1 Common battery, no coil, condenser or ringer. 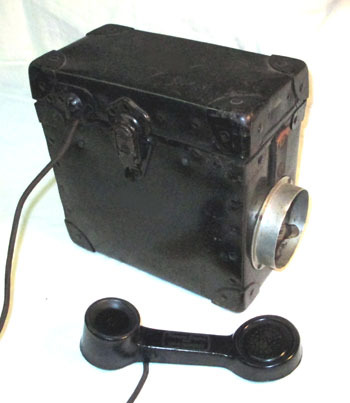 F1AW handset, D4U-9 mounting cord. Typically used as a desk stand replacement, where a magneto subset was already in place. e.g. replacing a D-series mounting or 20AL desk set. Catalog 11: "...intended for use in individual line, regular PBX extensions and bridged stations. Each set consists of a hand set, a telephone set mounting and the necessary cords and wiring. The telephone set mounting coded AA1-3 is the same as the NO. 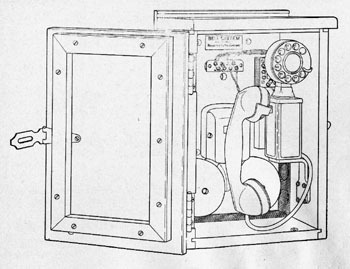 H1-3 Telephone Set Mounting except that the condenser, ringer and induction coil have been omitted. Each set, therefore, requires a suitable subscdriber set associated with it in order to complete the station equipment. If desired, the No. 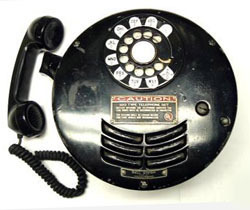 250 type Telephone Set can be readily converted to the No. 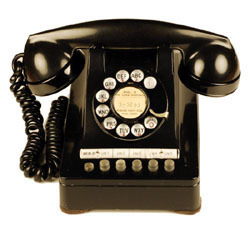 302 type Telephone Set simply by adding the condenser, ringer and induction coil." 250AW: 82A-3 apparatus blank. 250BW: 5HA-3 dial and 59A dial adapter. NOTE: For those searching for an "AA1" cradle phone, try looking for the A1 instead. No ringer or Bell System markings. F1AW handset, D3AL-9 mounting cord. Has a special mount for a harmonic ringer. Typically sold to independents, who would add a straight line or party line ringer as required. Catalog 11: " The No. 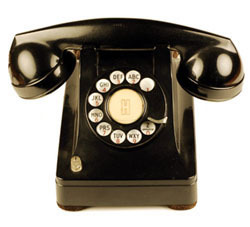 251 type TelephoneSets are intended for use in common battery manual or dial service on selective party lines using a harmonic ringer. Each set consists of a hand set, a desk type telephone set mounting, the necessary cords and wiring. The telephone set mounting coded AB1-3 is similar to the No. H1-3 Telephone Set Mounting except that it is furnished without a ringer and is provided with a special ringer mounting for a harmonic ringer." 251AW: 82A-3 apparatus blank. 251BW: 5HA-3 dial and 59A dial adapter. Wall set, No ringer or Bell System markings. F1AW handset. Has a special mount for a harmonic ringer. Typically sold to independents, who would add a straight line or party line ringer as required. Catalog 11: " The No. 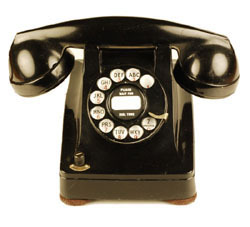 252 type TelephoneSets are intended for use in common battery manual or dial service on selective party lines using a harmonic ringer. Each set consists of a hand set, a wall type telephone set mounting, the necessary cords and wiring. This set is the equivalent to the 251 type Desk Set. The telephone set mounting is similar to the No. M3-3 Telephone Set Mounting except that it is furnished without a ringer and is provided with a special ringer mounting for a harmonic ringer." Outdoor Use, metal enclosure. Replaced by 325. E1D handset, 147A condenser, 149D condenser, 155B induction coil, 68L ringer. 300AW: 80A apparatus blank. 300BW: 4HA-3 dial. 300CW: 4hB-3 dial. 300DW: 4HE-3 dial. Early set with issue 1 wiring diagram has a 1010A handset. Sets shown in catalogs have F3 handsets. Party Line "lift plunger to dial or talk" stamped in white on cradle. Right plunger lifts. 101A coil, B1A ringer. For use at a Key Station - 1A key telephone system wiring plans. 4-conductor mounting cord to separate ringer and talking circuits. 101A coil, B1A ringer. 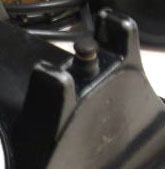 The H1 mounting is modified to prevent crosstalk. Induction coil equipped with 39A shield. Party line, 4-party selective, 8-party semi-selective. 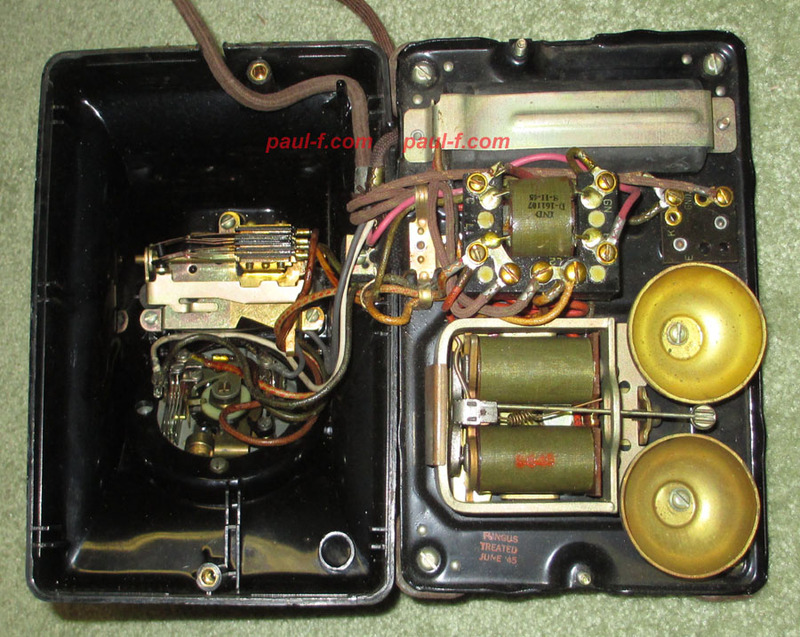 B3A ringer, 195C Capacitor, 101A coil and 333A, 372A or 426A electron tube. 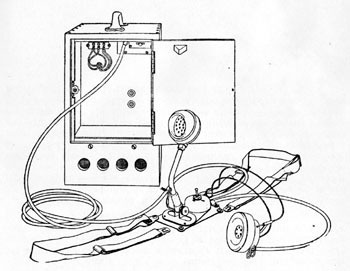 Party line, 306 components plus a hookswitch labeled "lift plunger to dial or talk". Right plunger lifts. For a similar cradle, See Photos of the 307. Local Battery talking, common battery signalling antisidetone. For use on nonpolarized ringing lines. B1A ringer, 387A capacitor, 104A coil, 266A inductor. 307A may be wired to a magneto subscriber set (C38.565). Large round heavy wall set that screws onto a large mounting bracket. Works are in an inner compartment, so any sparks generated are contained. F6AR handset, later sets (or refurbs) used G11A handsets. Very similar to the later 520 shown here. Provided with 2A key telephone systems to furnish the loud speaking and distant talking facilities at the master station. Apparatus is mounted on a metal chassis and enclosed in a walnut veneered cabinet. Three position volume control and talk/off/signal switch on front. Requires separate 112A tube amplifier. Often mounted flush with the interior wall with a frame and glass or metal door. Portable set in wood box for use on pierheads and vessels. 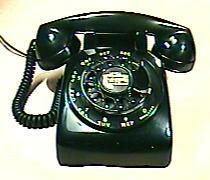 2-wire or 4-wire, 592 ringer (see below), and handset or head-chest set. Outdoor, weatherproof - Door with rounded top and bottom. Several variations were produced, some to fix problems with the hookswitch. See the BSPs for details and wiring alternatives. The KS-8028 lock provided self-locking when the door was closed. For non-self locking, the lock was replaced with a KS-7861 lock. With no lock in place, the door was still self-latching, so would stay closed - although not secure. KS-8028 lock and key also used on the later 525 shown here. Outdoor, weatherproof - Rectangular box enclosing a 211 set and 592 ringer. Basically a B1 ringer and capacitor in an enclosure. Single line for use with M1 subscriber carrier system. Similar in appearance, but somewhat larger than, the 302 type. F1G handset, 14-conductor mounting cord, 5HB dial, 3 resistors, condenser, B3A ringer and multicontact switchhook. J98701A and M1S1 Subscriber Terminal use 2 of 10 channels for bidirectional communication over power lines to remote locations. No ringer, capacitor or coil. 4-Operating Spring hookswitch with auxiliary spring (C32.575). 10-terminal connecting block, D10D-9 cord and F2B handset. Provision for separately ordered 7-type buzzer and 152A capacitor. Provided with 2B key telephone systems to furnish the loud speaking and distant talking facilities at the master station. Apparatus is mounted on a metal chassis and enclosed in a walnut finished wooden cabinet. Power on/off switch, volume control and off/talk/signal switch and pilot lamp on front. Amplifies speech in both directions. 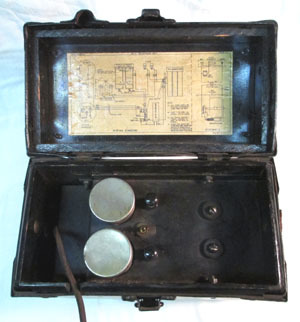 331A: In gray-green metal rectangular box with carry handle, contains magneto, batteries, 104A coil, cap and F3B-3 handset. 331B: Later set in bright blue with G5CR-3 handset. Sets made after 3/78 use a Trimline-style network on a printed circuit board. 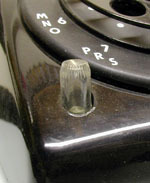 Receiver volume control (right hookswitch knob has 3 marked positions - H, M and L). Requires 4.5 vdc to power the amplifier. Receiver volume control (right hookswitch knob has 3 marked positions - H, M and L), Requires 4.5 vdc to power the amplifier. For party line, polarized ringing. 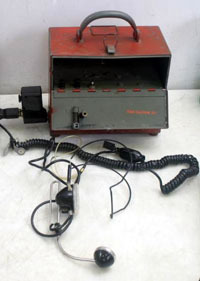 Used at common battery antisidetone stations on nonpolarized ringing lines -- Individual lines, 2-party selective (flat or message rate), 4-party semiselective, divided code ringing, nonselective party lines, regular PBX stations, 755A and 750A keyless stations, 2-party automatic ticketing, 2-party flat rate, automatic message accounting and zone registration service. Note: 354C Special wall set modified for 2-line operation. See photos. Used at common battery antisidetone stations -- 4-party selective and 8-party semiselective service. Wall, Local battery talking, common battery signalling, B1A ringer, 104A coil, 387A capacitor, 266A inductor. Used in same services as 354 except tip party dial message rate stations. WE 302-AW-3 set used in the military. Bottom plate secured by 2 screws. 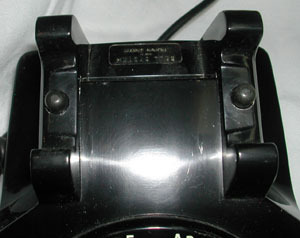 If converted to dial, usually has a TA-45-type dial by AE or Telephonics. Military version of 302. Designed to be moisture resistant, fungus resistant and to keep insects out of the set. Rubber grommets seal the cord holes. Intended for use in damp tropical climates (South Pacific, WWII). Bottom plate secured by 4 screws (different design than production 302s). 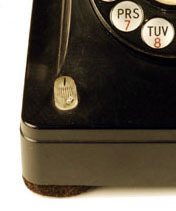 Telephonics or AE dials used, with finger stop near the 6 o'clock position. 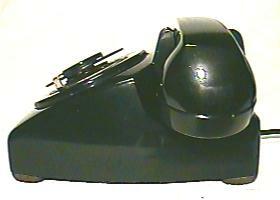 Modified version of the TP-6. Used after the war in civilian applications where moisture could be a problem, such as along waterfronts or marshy lands, laundries, etc. 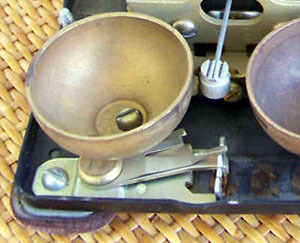 When parts needed replacement, standard 302 parts were used, including WE dials. Capacitor: D-171240, 2 mF 130v, 0.5 mF 200v. Bottom plate with 4 screws. No grommets on cords. 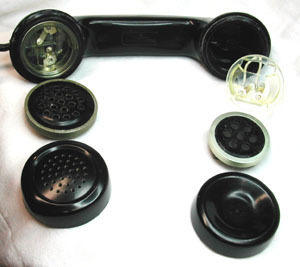 Once an original part is replaced with a non moisture-treated part, "These sets are treated as 302-type telephone sets." Appears to be a military variation -- uses the TA-45G/GT dial and was Fungus Treated in June 1945. 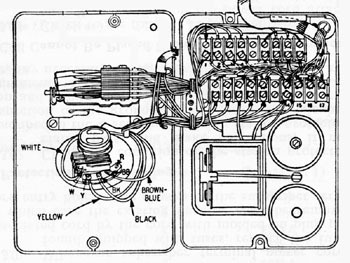 Wiring diagram in a found set is marked for use with D-167964 (manual), D-168869 (dial), and D-170901 (manual) Telephone Sets. 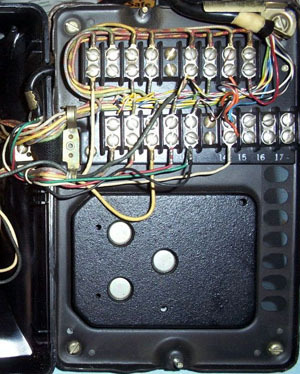 A wiring diagram shows a 6-conductor mounting cord, separating the ringer leads and providing an extra hookswitch contact closure -- probably for use with a PBX. Sets with these markings have been found. Note that SC5634A is marked on the D-161583 above. Sets marked D2933 all appear to have frequency ringers. the -L suffix may indicate a 42 Cycle ringer. Please send any additional found set markings or descriptive info. 2-line or KTS 1A system, turn-switch on front left corner. Key can be wired for 2-line pickup or one line pickup with extension cut-off, ringer cut-off or headset control. Note: Earlier knobs were opaque. Later knobs were clear. Buttons could be hold, pickup, signal or cutoff (turn button). Check the BSPs for details on the numerous variations and suffix codes. A good starting point is 502-435-100. Cutoff or Exclusion may be on a right turn button or the right plunger, depending on model. 6-button keyset for use with 755A PBX. Only one set of Tip and Ring go to the set, as line switching was done in the PBX. 5300 series sets are 300 sets disguised as 500 sets. The base and components from a 300-series set were covered with a new thermoplastic housing that looks similar to a 500-series set. 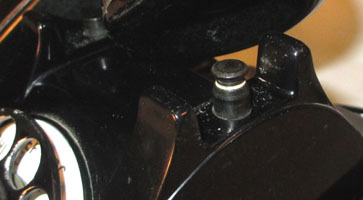 Since the bottom plate of the 300 is shorter than that of the 500, the housing is shorter and looks cut off in the back. 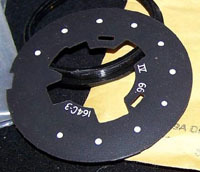 The 3" dial is mounted in the housing, as on a 300 set. 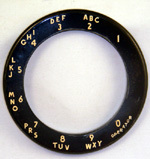 5M or 6H dials included a black porcelain number plate with white dots, like the plate on the number 7 dials. A new double injection molded plastic number ring surrounds the dial, completing the disguise. 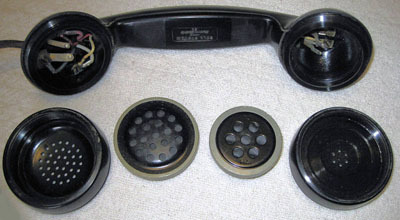 The 5302's normal handsets were a standard F1, or a "GF" handset that used a G1 handle with adapters and different caps for the HA1 and F1 elements used by the 300 series (Photos below). 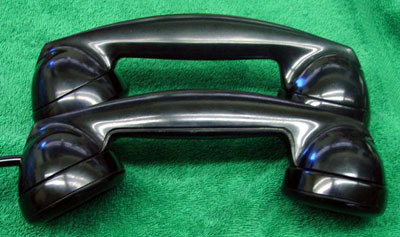 G1 or G3 handsets with the later T1 and U1 elements are also found, as are other G handset variations, such as a G6 amplified handset -- often supplied where their transmission characteristics were required, or added during refurb or by collectors. The cradle has a unique shape with depressions to accommodate the narrower F handset shape, as well as the G handset. simulating the adjustment wheel on the 500 set's C-series ringer. Since most sets did not have the transmission characteristics of a 500 set, they were limited to installation in zones relatively close to the central offices. Produced from August, 1955 - ? Housings from the mid-60s have been found, but may have been made as repair parts. a Bell Laboratories Record article, August 1956, page 313. BSP references start in 1956. Introduction was 6 years after the announcement of the 500-series. Contrary to the popular rumor, the 5302 was not the missing link "between" the 300 and 500 families, but was developed later to make productive use of the huge supply of 300 series parts that were within the Bell System. 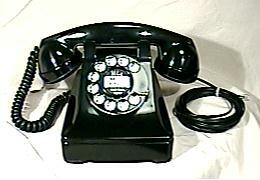 Subscribers could get a modern looking phone that looked like the 500, while the Bell System improved their return on investment. 5300 sets were not made "new" on the production line. Housings and ringer adjusters were installed on batches of sets that were returned for refurb. There is a great variation in the way sets were marked on the bottom -- both in color and location of the bottom stamping. 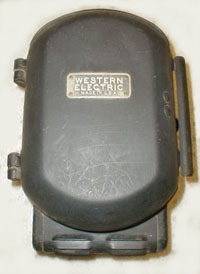 Western Electric sold conversion kits with instructions to refurbishers. Often refurbishers took short cuts, such as not marking the model number on the bottom or not installing the ringer adjustment hardware. 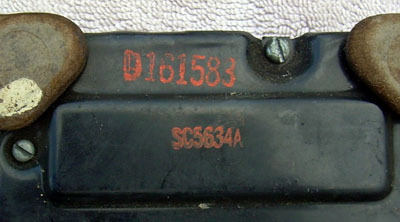 Sets produced by independent refurbishers have been found with different model numbers, such as 5310. 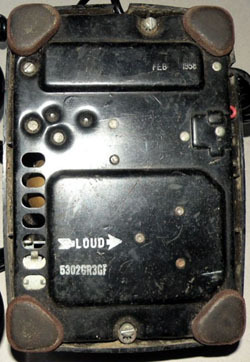 Note that dates on the set and internal components are usually those from the "donor" 300-series phone that was converted to a 5300-series set, and do not indicate the assembly or conversion date for the 5300-series set. 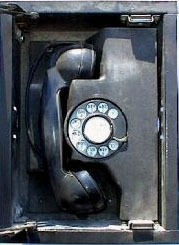 5300-series phones are difficult to date, as no assembly dates were usually indicated on the phone. The assembly date can generally be assumed to be after the date the housing was made. However, it is possible that the set was converted and then later refurbished with a newer housing. The models shown below were created from standard 300-series sets. A 5 prefix was added to the model number. 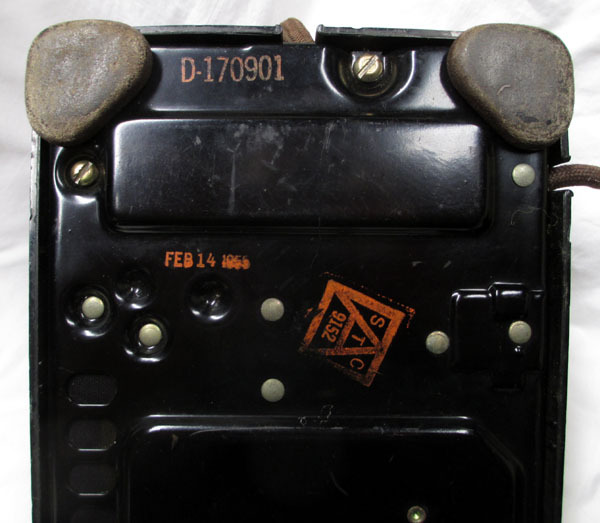 Technical information can also be found in the BSPs for the original 300-series model number. Single line wall set, 101A coil, B1A ringer. 2-line. Key (turn-switch) below and to the left of dial. 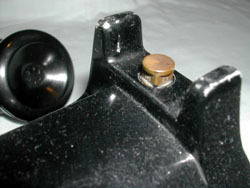 The 410's line switch knob was replaced with a longer knob. * Also see the BSP for the basic related 300/400 series set for details . Note: Handsets for use within the Bell System were marked "Bell System". 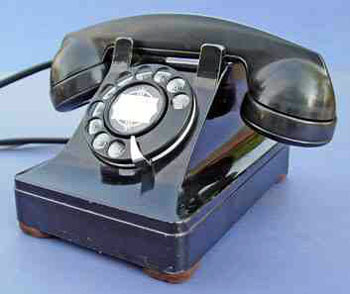 Standard handset for general use with 3-wire cord. HA or LA series receiver and F series transmitter elements. F1W has no Bell System markings and was sold outside the Bell System. With 4-wire cord. Some have 289B dual phone plug for PBX use where the operator preferred a handset to a headset. With a pushbutton in the handle. For push-to-talk, push-to listen, amplifier or external circuit control. With G handset receiver element (U1 receiver and F1 or T1 transmitter) and 3-wire cord. For applications on long loops. 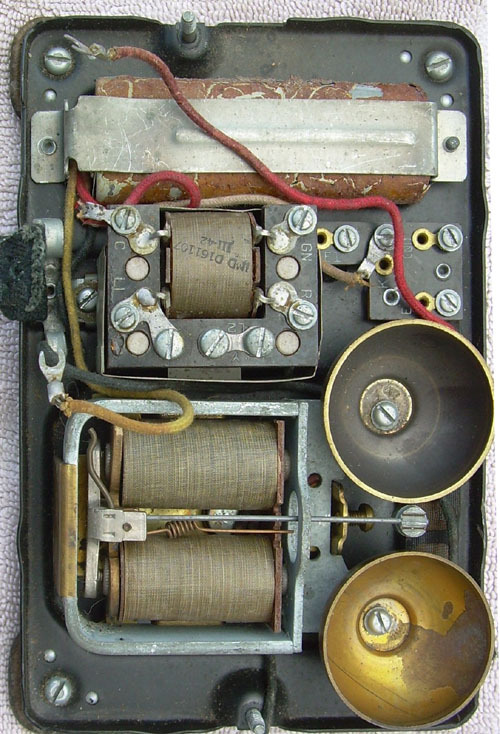 Some time between 7/54 and 2/56, the transmitter was changed from the original F1 to the later T1 with a spacing ring. With G handset receiver element (U1 receiver and F1 or T1 transmitter) and 4-wire cord. For applications on long loops. For explosive atmospheres, 320 set and KS sets. 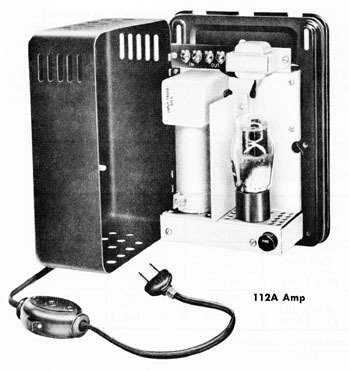 HA1 receiver and K1 transmitter. 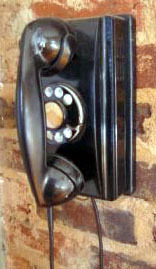 Standard F1 handset elements in a G1 (or occasionally G3) handle with special inserts and caps. For 5300-series sets. Receiver cap is marked "H" and Transmitter cap is marked "F" See photos below. The handle is stamped with the US Government contract reference, and has no Bell System markings. Link to similar info on G Handset Models. Note that handles are usually marked G1 or G3 (the pre-conversion marking), NOT GF. Cups in transmitter and receiver cavities adapt to the F and HA elements. 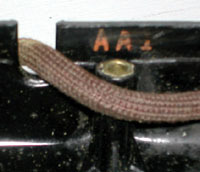 Transmitter cap is marked "F" in center. 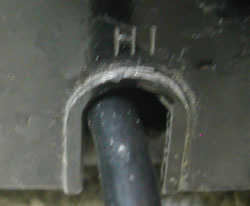 Receiver cap is marked "H" in center. Note: Dates in parenthesis are earliest and /or latest dates observed on marked handles. *The info in the chart is from observations of many F1 handsets by Dave Johnson, with additions by Paul Fassbender and Doug Rose and discussions on the ATCA and TCI listservs. 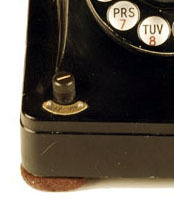 Handles made after early 1939 are generally not dated, so handle dates are estimated using sets with matching dates on other components (handset elements, bottom plate, inductor, ringer, etc.). 2.02 Lightweight F1-type handsets may be distinguished from the regular handsets by their lighter weight plastic, hollow handle, and an embossed dot following the code number on the handle. Transmitter and receiver caps for light-weight handsets are not interchangeable with regular caps because the threads are different. Caps for the heavier handsets have a number molded in the center of the underside of the grid; lightweight caps do not have such a number. 2.03 A lightweight handset should not be used to replace a regular handset. Its lighter weight may not operate reliably a switchhook designed for a regular handset.